Only 10 percent of the population in Papua New Guinea (PNG) has access to the national electricity grid, leaving 6.3 million people without access to the energy needed to meet their basic needs. Lack of reliable lighting limits people’s ability to undertake daily activities like household chores, reading, schoolwork, and conducting business outside of daylight hours. There is an emerging opportunity to provide clean, sustainable and affordable lighting solutions to under-served and off-grid energy consumers in PNG through quality ‘pico powered lighting systems’ (PLS). Commercial attempts to distribute PLS products are at an early stage of development and the majority of systems that currently exist in PNG have been have been distributed as part of donor programs, NGO/church based initiatives and CSR activities. These activities are almost always on a small scale, often involving poor quality products with no after sales support or consumer education. 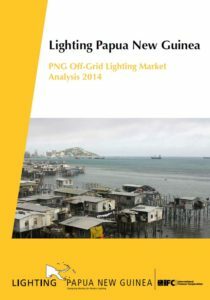 Some specialist electrical retailers sell PLS in PNG’s urban and provincial centers, and IFC estimates that 30,000 PLS were imported into PNG in 2012. However, these were largely of poor quality and little effort has been made to distribute and retail them beyond urban centers. Nevertheless, all retailers interviewed for this report testified to vastly increasing sales over the last 12 months, suggesting increasing consumer awareness and demand driven by word of mouth.